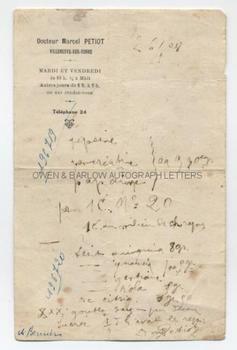 MARCEL PETIOT Autograph Prescription Signed. French serial killer, known as 'The Butcher of Paris' and 'The Modern Bluebeard'. 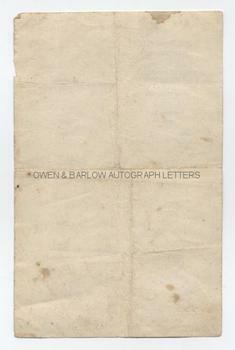 Autograph prescription on his headed notepaper. 1p. Villeneuve-Sur-Yonne. 26th August [no year]. 12 lines, signed and dated. 12mo. Approx 6 x 4 inches (15 x 10 cms). Central fold. Some marking and staining, else very good. This prescription was written sometime between 1921 and 1932, this being the period during which Marcel Petiot was practicing in Villeneuve-sur-Yonne, where he established something of a dubious reputation for abortions and the prescribing of narcotics. Dr Marcel Petiot is thought to have murdered around 60 people, although the true number of his victims might be much higher. He began his killing spree in 1926 with the daughter of a patient, but most of his murders took place in German occupied Paris during World War II. He became wanted by both the French authorities and the Gestapo and he adopted various disguises and identities and went into hiding. After the war, when he was eventually arrested, a web of intrigue emerged at his trial in which he claimed to have been involved in the French Resistance and in counter espionage. These revelations, together with the manner in which he had killed and disposed of his many victims, became the subject of an international media circus and he has since been the subject of several films and books. Marcel Petiot was executed by guillotine in 1946. Autograph material of Marcel Petiot is extremely uncommon.